Looking for a birthday or Christmas gift for a musical friend, music teacher or student? These fun music calendars fit the bill nicely. Our Music Quotes and Composers 2008 Calendar contains inspirational photography with quotes from Classical Composers. has music clipart cartoons and very funny music quotes from well known composers that you may never have heard before. has eclectic music cartoon instrumental musicians with fun music slogans on various months. 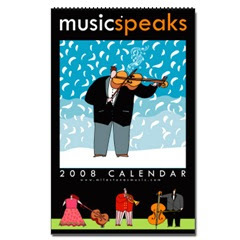 All our music calendars are printed by CafePress.com, offering a high quality gift for a favorite friend or teacher.